This is a very cute colored student outfit for kids from 1-3 years old, the outfit comes complete with one Brazilwood bows. It has double pearl eye, Real unbleached Mongolian horsehair, nice light weight case and rosin. It comes with a new bridge and high quality strings. Good sound. Total retail store price is $199.99 or more. Actual item looks much better than photos here. ●Set up and ready to play. ●Hand carved with high gloss finish. ●Nice solid wood (not fiberglass) violin with genuine Mongolian horsehair bow. ●Solid wood top and solid wood back, sides, neck and scroll. ●Hardwood pegs, fingerboard and chin rest with four fine tuners. ●Lightweight case with rain proof canvas exterior and shoulder straps. 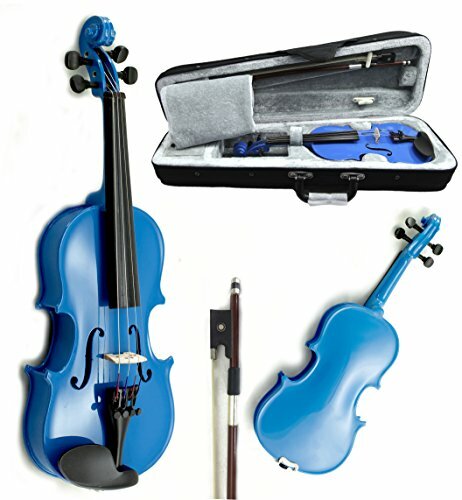 Beautiful SKYVN202 blue lacquer 1/16 size children violin. Comes complete with one Brazilwood bows. Set up and ready to play. If you feel the peg does not stay, using a little force,press the pegs inward while tuning, this can increase the fraction between pegs and peg box and help the string stay in tune.